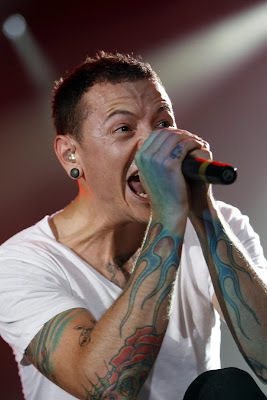 Chester Bennington is the extremely creative American musician and singer-songwriter, best known as the lead vocalist of the rock band, Linkin Park. 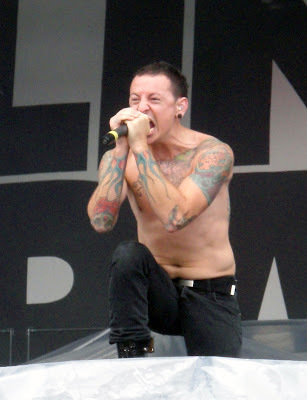 Chester Bennington has a large number of tattoo designs, including the name of his band "Linkin Park" across his lower back in large old English letters, along with two huge dragons and a four-armed creature in the center of his back. The tattoos on his left arm include, a large koi fish, long blue flames around his wrist and forearm, and butterflies on his elbow area. 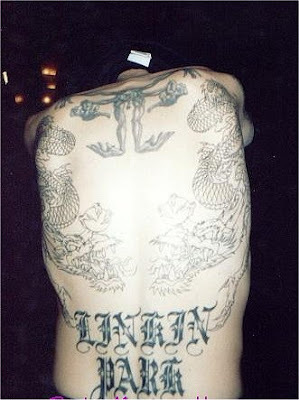 The tattoos on his right arm include, a ring of blue flames around his wrist identical to the one on his left wrist, skull with diamond eyes and a spider web on his elbow, plus another koi fish along with flower peddles and other vegetation on his upper arm. 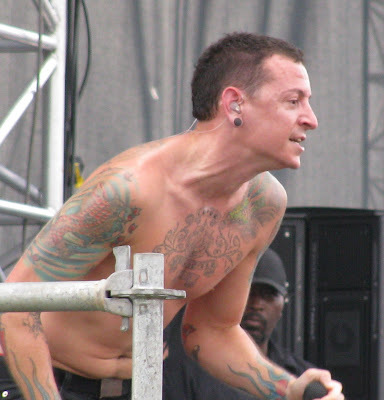 Chester has a large rose in the center of his chest with three banners and the initials "CB TB" "JMB DSB TLB" "IB" which is in honor of his close family members.